Kids Crafts : She buys cheap pillows and creates unforgettable gifts for her children! 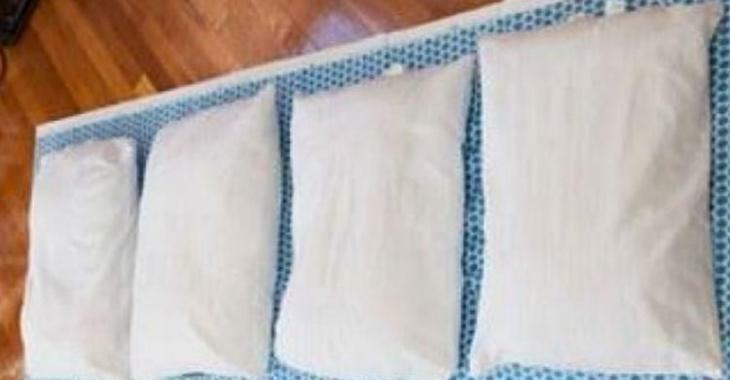 She buys cheap pillows and creates unforgettable gifts for her children! They get to sleep all night on these mattresses! I made 2 mattresses like these ones to my nephew and my niece pour their birthdays! Apparently, they love it! They take them in the living room to watch movies on weekend mornings! And since the beddy-byes in the evening are less painful for mom and dad. They get to sleep all night on these mattresses! Imagine! Haha! I made mine with pillow cases that I returned to sew them. I wanted my sister to easily remove the pillows to wash the covers. But it was a challenge to sew two pillowcases one against the other, side by side on the 2 sides of the pillowcases! I was mistaken twice! I did it again and for the 2nd mattress I got it right the first time! Would you like to make your mattress too? 3 or 4 or 5 cheap pillows for each mattress depending on the length you want. Fabric, a simple duvet cover, or pillow cases because it’s easy to wash with washing machine by taking out the pillows. But take the time to read my intro, I explain that it’s not that easy. (Optional) Wide ribbon in fabric. Because on my mattresses, I added handles in order to carry them when we go to sleep at grandma and grandpa or do camping and a long strap to roll them. You will only have to measure the width of a pillow and reduce the width of the cover by making machine seams on each side. Then insert a pillow and make a seam. Add a second pillow and make another seam, so on for the 4 or 5 pillows! If you make it with pillow cases, you will have to sew them side by side, but BE CAREFUL! Then return the pillowcase to sew the other side. This is very hard to explain by writing. You will understand when you will do it. Install the pillow bed in a corner of the room and create a cozy little nest! WARNING: If you use light garlands like in the picture, use LED bulbs. They emit less heat. The duvet cover for single bed! The one for my nephew on the Paw Patrols’ theme. Here it’s rolled and attached thanks to a strap forming a loop. We can see the 2 handles, in this way it’s easier to carry. You can see better the handles forming a U. The one of my niece on Frozen’s theme and in purple! Because it’s her favorite color!